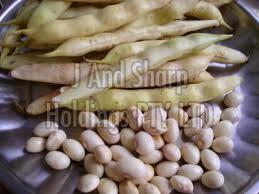 We supply White Butter Beans, which are organically cultivated and are very low in calories (60-70%). For the safe storage of the entire lot, we have a capacious and well-structured warehouse. Moreover, regular up-gradation in the warehouse is done to meet the changing scenario. Based in Johannesburg(South Africa), we are one of the most sought after names when it comes to qualitative and cost-effective products.